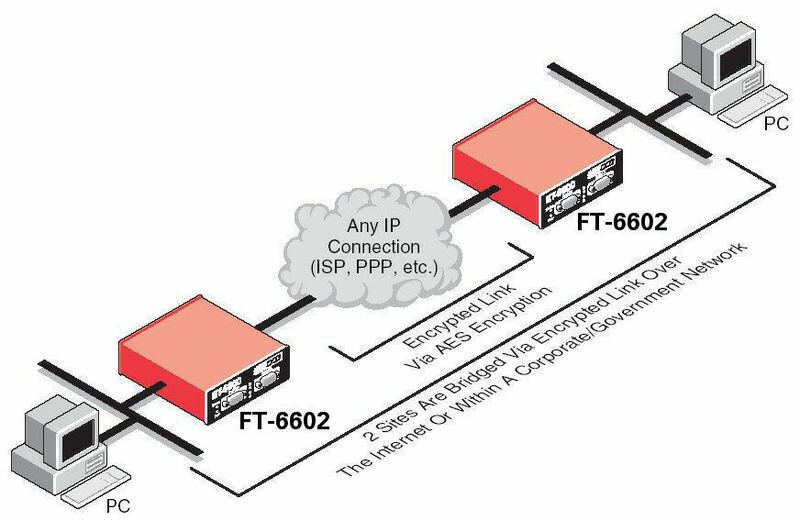 The FT-6602/6632 creates an encrypted tunnel through IP networks. The FT-6602 features three Ethernet LAN ports and a serial port for initial setup, the FT-6632 2 Ethernet ports and a serial port. The FT-6602/6632 encrypts data between private networks using the public Internet or any other network as the transport. The FT-6602/6632 can be a server, a client or a client & server device. As a server, the FT-6602 supports up to 25 simultaneous clients. The FT-6632 support up to 50 clients. The FT-6602/6632 Ethernet user data transport may be either TCP/IP or UDP. UDP is preferred for wireless links, for voice and for video transport. An FT server can support UDP and TCP/IP simultaneously. The FT-Soft client software allows any Windows workstation to connect to any FT server as a stand-alone client. This is quite useful for stand-alone dispatch workstations or portable notebook-based operations. Click here for more information on the FT-Soft software client. The FT series uses a FIPS certified encryption module. AES is used for the bulk data encryption. SHA1 is used for signing and RSA 2048 for key exchange and authentication. A USB memory device is used for certificate information storage. The FT-6602 Ethernet ports are all 10/100BaseT. The FT-6632 Ethernet ports are 10/100/1000. The serial port can be used for initial IP setup. The FT's are typically setup and managed using a browser. The server has a fixed IP address. Clients can use DHCP or have fixed IP addresses. The FT series operate through firewalls with only one port of your choice opened. It bridges all Ethernet protocols including IPX, IP, NetBEUI, and other proprietary protocols. The FTs are straight-forward, easy to configure and maintain. They have state-of-the-art AES encryption security without the configuration complexity of VPN.